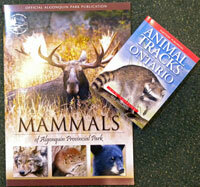 Purchase Set #5 and receive Mammals of Algonquin Provincial Park and Animal Tracks of Ontario at a great low price. Fifty-five species are on Algonquins mammal list. This book looks at their life histories, physical characteristics, and behaviours. Spectacular colour photographs of the Parks mammals to help make it easier to identify them, and illustrations that are a useful reference to distinguish tracks and scats are included in this new and heavily revised edition. 52 pages. Dan Strickland & Russell J. Rutter. 2018 (8th revised edition). Designed to help you identify tracks of all shapes and sizes. Perfect for all ages of backwoods explorers ad naturalists. Very popular little book. Sheldon. 2017. sc. 159 pages.